If you are planning a corporate event and are looking for a fun and relaxed outdoor catering option, then Le Café Crème could be the perfect answer. 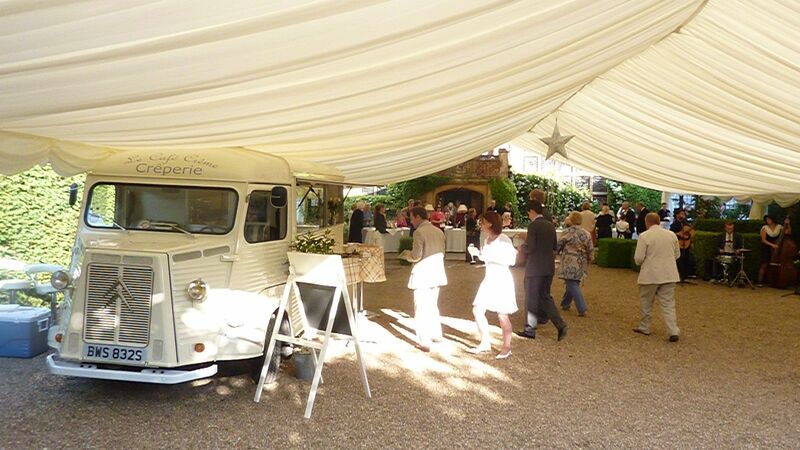 If you are thinking of offering a full meal as part of your event why not combine Le Café Crème with another savoury catering option such as a BBQ, hog roast or pizza van. Alternatively, you may just want to provide a sweet snack and our delicious crêpes do seem to be universally popular! We can also provide our range of freshly brewed coffees and teas. Crêpes are prepared to order in front of your guests and we can serve up to 80 sweet crêpes an hour. We can offer two payment options: either a flat rate for a certain duration of serving (with guests able to come back for seconds (and thirds!) if they want); or a ticketed system where you purchase a certain number of servings which are then redeemed by guests on presentation of their ticket.